Here are the biographies of those on the Return to Flight Task Group who saw the NASA engineering by PowerPoint and denounced it in their final report (quoted extensively in the last 2 pages of my essay). As I wrote in the essay above, "Both the Columbia Accident Accident Investigation Board (2003) and the Return to Flight Task Group (2005) were filled with smart experienced people with spectacular credentials. These review boards examined what is probably the best evidence available on PP for technical work: hundreds of PP decks from a high-IQ government agency thorough practiced in PP. Both review boards concluded that (1) PP is an inappropriate tool for engineering reports, presentations, documentation; and (2) the technical report is superior to PP. Matched up against alternative tools, PowerPoint loses." Elizabeth Lane Lawley, a professor visiting Microsoft, comments on "the culture of the deck." Her experience at Microsoft is comparable to that of the NASA Return to Flight Task Group with regard to the persistent disutility of using PP decks to replace technical reports. Now available: 2nd edition of The Cognitive Style of PowerPoint as 32-page essay or ebook. This essay is also a chapter in Beautiful Evidence. Here is a link to William Harwood's excellent account of shuttle risks in the upcoming flight, scheduled for this Saturday, context for my comments that follow. About 18 months ago in Houston I reviewed the shuttle Probability Risk Assessment (PRA) material for NASA. PRA works with a list of possible threats, estimates their probablilities and expected losses, and then seeks to assist decision-making for shuttle risk-reduction. (1) They should prepare a detailed summary matrix (on, of course, 11" by 17" paper), ordering the risks and providing, in a comments column, relevant background for each estimate. Let that intense matrix, backed up by similar more-detailed 11" by 17" arrays of risk estimates, be the main presentation device and analytical tool for making decisions. This was designed to replace their chippy and twiddly PP slides, which made a hash of their good technical work and made it difficult to assess the overall risk context. (2) The PRA assessments did not take into account a major risk factor in both the Challenger and Columbia accidents: on-ground intellectual failures in engineering analysis. In the case of the Challenger, the analytic process on the day before the accident was seriously deficient, in the sense that--in hindsight to be sure--the Challenger would not have been launched on that very cold day (which compromised the O-rings and caused the accident) if smarter engineering analysis and better decision-making had taken place. In the case of the Columbia, better analysis and decision-making during the flight might have yielded rescue efforts to try to save the crew, which was endangered by damage to the Columbia suffered at launch. I suggested to the PRA group that on-ground analytic problems contributed to something like 1.3 of the 2.0 accidents in the 113 flights. But there was no risk assessment of such in the PRA; that is, about 65% of the directly observed empirical risk in the 113 flights was not accounted for by the PRA model. The shuttle itself was considerably less risky than what was happening on the ground in decision-making about the shuttle. At the meeting, I also handed out Richard Feynman's famous discussion of shuttle risks, which Feynman prepared as a part of the Challenger investigation in 1987. The analysis for the upcoming launch of the Discovery in July 2006, as the link above indicates, was an intense evaluation of risks and trade-offs. On the basis of reading some of the public documentation (and no direct knowledge) for the upcoming flight in the last few weeks, I think that NASA has made a reasonable and well-informed decision for the upcoming flight. It was also a contested decision. I would vote for the launch. The on-ground factors that contributed to 1.3 shuttle losses appear to be mitigated by the thorough analysis for this flight. The current risk number is a cloudy 1 in 100, which is risky but has been acceptable in the past. The cloudy contributions to risk are the recent changes in the foam, which turns Discovery into something of an experiment. In the Discovery discussions, a telling distinction was made between "programmatic risks" and "crew risks." The programmatic risk is very high right now no matter what happens. Having flown once in 3+ years, the shuttle program might well collapse if unable to fly soon (within a year or so), or if there is another accident even if the crew escaped unharmed. This rescue scenario is itself troublesome, since the rescue launch must quickly take into account what caused the need for the Discovery crew-rescue in the first place. POWERPOINT FOR DISCOVERY FLIGHT READINESS REVIEW: THE FOAM SLIDES, OR "MAKE THAT CALL NOW, THAT'S 1-800-. . . . "
Here is the PP deck for "STS-121, Flight Readiness Review, External Tank Project (ET-119)." These slides summarize the results of the enormous amount of resources (probably >$1 billion, some estimates are much higher) devoted to the external tank foam problem. The slides do not display a sense of engineering intelligence or discipline. In the main report, there is a persistent habit of dequantification and a general absence of units of measurement. The back-up slides are more quantified and at a higher intellectual level. Several of the slides look like they were produced by a designer lacking in scientific training. The key overview slide (page 3) is a very good idea but a presentation mess. The good idea is to have an intense and fairly detailed summary early in the presentation. But PP's lightweight resolution and lousy design tools compromise the summary slide. Students of PP design might, however, appreciate the 5 sets of orange drop-shadows, 4 wavy-purple color fields, 3 unintentionally 3D blue time-lines, 2 overactive grids, and floating-off-in-space bullets in the highlight box (with an arbitrary change from dots to dashes midstream in the box). All this stuff on one over-produced but importantslide. The bullet lists tend somewhat to be base-touching grunts, which show effects without causes, actions without actors, verbs without subjects, and nouns without predicates. The branding with 3 logos on every slide (the title slide has 4 logos) is unprofessional, pitchy, turfy. Are we doing engineering analysis or marketing here? Some 20% of the space of every slide (already a a very low resolution display method) is devoted to branding and to the boxed-in awkward and repetitive slide titles. It is as if each and every slide has to remind the viewer what the presentation is about. So the top 20% of every slide is something to skip, perhaps putting some viewers in the mode of skipping and sliding through the rest of the slide. It is as if the top of every slide announces "nothing important here, you've seen it all many times before." In several slides, the visually most active materials are the cross-hatched exploding 3D arrows linking the external tank to the magnified areas. Why are the arrows pointing anyway? It's just a simple linking line. The idea here of close contextualized imaging of the problem areas is a very good one, but the badly-drawn giant blue arrows are silly, and result in making the dequantified images of the foam problem areas too small. The typography is poor, with odd hierarchies (underlined bold italic in parentheses at one point). Is "O2" the proper way for NASA contractors and NASA to write the oxygen molecule (even wikipedia uses a subscript)? Does the slide designer know how to write a subscript in PP? The overlapping statistical graphics on page BU-2 are presented as decoration, not evidence. The report is 33 slides long; yet about 10 slide-equivalents are essentially content-free (compulsive repetitive branding, twiddly hierarchical organization, empty space, assorted title pages, and so on). This PP fluffed-up material here and quite a bit more could easily be placed in a technical report on 4 pages of an 11" by 17" piece of paper (folded in half), an exercise left to the student. The tone and style of the presentation seem alienated from professional engineering. It looks like the slides were prepared by a PP designer, assisted now and then by an engineer. Or maybe it is just the PP pitch style diluting the content. At an FRR?! I hope the actual engineering for the shuttle is a lot better than the evidence for the engineering shown in this presentation. How much does a problematic presentational style signal poor engineering? Is it just PP or a PP designer weakening the quality of evidence? Or are there deeper intellectual failures? The dequantification, the failure to follow professional engineering conventions, the infomercial tone are worrisome. There is no sign of engineering discipline here, except in the back-up slides. Thus the effect of the presentation is to suggest that there just might be some problems with foam engineering and analytical quality. A danger of problematic presentational styles, such as NASA PP, is not only that they enable sloppiness but also that they can place the truth in disrepute. It is also a shame that all that expensive engineering work winds up being represented in this manner at a Flight Readiness Review. Did the news conference present the PP slides, or did they a different medium to convey the details? They usually give a brief talk and then answer questions in a straightforward and intelligent manner, accompanied by occasional physical props, such as the broken-off piece of foam or model of the external tank. They did not use PP in the 8 to 10 press conferences I've viewed. You can see the press conferences and the launch by going to NASA TV. Apparently the PP Flight Readiness Review for the foam (reviewed above) was something of a leak; the other FRRs at the meeting are not going to be made available. Keith Cowing, who runs NASA Watch, sent me an email saying that I might be interested in the foam FRR that he had posted at his website. You can see more on this at NASA Watch. I think the press conferences are excellent, assisted by a well-informed space press. After the flight, the head of NASA Michael Griffin was asked at the press conference if he felt "vindicated" by his decision to launch. He said not at all, if anything, it was vindication for the scientific method--that is, looking at the evidence and the numbers at hand. What a wonderful thing for the Director of NASA to say. This contrasts to the PP cognitive style, which often seems to encourage presenters to pitch rather than present evidence. Below, a link to a good account of the Discovery inspections by John Schwartz of the New York Times on the problem of distinguishing useful evidence from additional evidence, a problem that also occurs with newly developed exquisitely sensitive measurements (for example, PSA tests and the monitoring of contaminants of drinking water). Is the space shuttle Discovery safe to re-enter the atmosphere on its way to landing next Monday? Determining that it is, as the National Aeronautics and Space Administration did on Sunday, is an arduous process. Even though engineers and analysts say there is really no choice for an agency still climbing back from a horrendous re-entry accident -- the loss of the shuttle Columbia and its crew of seven on a bright February morning in 2003 -- the level of detail can sometimes seem absurd. Blame the tools that have been developed since the Columbia disaster. They give such stunningly clear and detailed images of the shuttle from orbit that there are endless new problems to worry about. On Sunday, mission managers announced results of their close look at every suspicious mark and irregularity on the shuttle surface, including stiff bits of cloth called gap fillers that were poking out of the underbelly, as well as loosened patches on insulating blankets. Before the Columbia, such problems would have probably not been noticed. Now, each becomes a potentially troubling issue, to be dealt with one by one by one by one. On Sunday, the sixth day of the 13-day flight, Steve Poulos, the orbiter projects office manager, said every item had finally been checked off.
. . . many breast cancers found by mammography screening have excellent prognosis not just because of early detection, but also because many of the cancers are relatively benign, requiring minimal therapy. from Sandra Y. Moody-Ayers, MD; Carolyn K. Wells, MPH; Alvan R. Feinstein, MD, MS, "Benign" Tumors and "Early Detection" in Mammography-Screened Patients of a Natural Cohort With Breast Cancer, Arch Intern Med. 2000; 160: 1109-1115. In your workshops, you describe how to replace PowerPoint presentations with 11 x 17 sized reports, and provide many good arguments for why "engineering by PowerPoint" doesn't work very well. This website that might interest you and your audience. It describes a process for creating A3 sized technical reports, and using them to make better decisions. Dr. Durward Sobek of Montana State University spent six months in Japan as a grad student, interviewing and observing Toyota engineers to uncover the reasons why Toyota was able to develop cars much more quickly than other auto makers and also maintain high standards for reliability. Toyota uses these A3 reports extensively in their engineering processes. They believe that the discipline required to accurately capture a problem on a single sheet forces the author to express the issue with both clarity and conciseness. They emphasize using visual models to express ideas rather than a lot of text, and value the ability to have all of the pertinent information within a single field of vision. The engineers are also required to bring their supporting documentation, so that the team can dive into the details when necessary. Since then, Dr. Sobek has taught many engineers how to use A3 reports to make better technical decisions. I can tell you from my personal experience with this technique that it is amazingly powerful. By using one of these reports, we solved a technical problem within a single meeting that we had literally wrestled with for years through engineering by PowerPoint. By forcing us to make our knowledge about the problem visible in a systematic way, the tool helped us come to a deeper understanding that led to the solution. The "A3 Process" described above begins with a good idea and then dilutes it into a Business Methodology Fad. BMFs are characterized by a germ of a good idea, but also by over-reaching, over-simplifying, excessive focus on a single idea, pitchy and enthusiastic over-simplified examples, and pretentious names ("The Toyota Method," "The Long Tail,", "The Genghis Khan Guide to Mastering the Universe," "The Takahari Guide to Infinite Profits," and so on). The A3 method, which at its heart is a good idea, requires some down-in-the-trenches detailed and complex examples. And it should avoid bullet lists in describing the method. One more piece: Lousy PowerPoint presentations: The fault of PP users? Central Command Charts Sharp Movement of the Civil Conflict in Iraq Toward Chaos, by Michael Gordon in the New York Times, Nov. 1, 2006. Here are some preliminary comments on the slide "Iraq: I&W of Civil Conflict." Note the measurements, definitions, and comparisons to standards in the customer scorecard in the "Report of the South Central Connecticut Regional Water Authority" (above). followed by many good alternative methods and examples for technical presentations. Comparisons of methods for presenting cancer survival rates. Metaphors for presentations: Conway's Law meets PowerPoint. than marketing and computer programming. What are the the causes of presentations? which also appears as a chapter in Beautiful Evidence. John Wheeler, eminent physicist, died in 2008 at the age of 96. To commemorate his contributions to physics, astronomy, cosmology, quantum mechanics and more, the April 2009 issue of Physics Today contains several wonderful articles about Wheeler. The article, "John Wheeler, relativity, and quantum information", by his former-students Misner, Thorne and Zurek (all prominent physicists themselves, now) contains this photograph taken by Kip Thorne. The caption reads, "John Wheeler lecturing at a conference in Cambridge, UK, in 1971. Wheeler's style was to cover the blackboard with inspirational colored-chalk diagrams and phrases before the lecture, then work his way through them, one by one." The blackboard looks like a precursor to today's PowerPoint presentation, but not poor PowerPoint full of bullet grunts. Instead, a sequence of diagrams and key phrases to guide the audience, and the speaker, through the material. Judging from the photo, this must have been quite the lecture. The picture of Professor Wheeler prompted me to finally stitch together pictures of two blackboards I saw at Baylor School of Medicine in 2005. To this day I have no idea who drew them, but it is one of the Baylor Biochemistry professors. UPDATE 14 May 2009: Juan Ruiz-Hau was kind enough to prepare these excellently corrected versions from the originals. Steve Balmer, ex-CEO of Microsoft: "No more decks"
There was an interview with Steve Balmer, Microsoft CEO, in the Sunday New York Times. When asked what it's like to be in a meeting run by Steve Balmer he says that he decided that what he calls the "long and winding road" meeting style of a few years ago at Microsoft isn't productive. He says that for most meetings, he now gets the materials in advance and he reads them. For the meeting he comes in and says "I've got the following four questions. Please don't present the deck." "The oversight [of scientific data] is now vastly diminished. Even within the laboratory environment, many students and post-docs and scientists are not showing raw data anymore. They're showing PowerPoint presentations. That gives the individual, if they're so inclined, the ability to manipulate data right up-front. Unless a mentor is vigilant, there's a real breakdown." I took Presenting Data and Information a few years ago in Boston while at another company, but ET's influence has stuck with me. In my first year at my new employer, I can confidently credit the course with my win of an Individual Achievement Award in recognition of my technical analysis briefings of a systems performance problem which I resolved, as well as my recent win of my company's 2009 Information Systems Excellence Award in the Innovation category. My "Quick Start Guide" for the roll-out of a crucial new capability in the network was designed and built by the book (the Tufte Book) - on an 11x17 folded sheet, multiple columns with embedded illustrations, plus full bleed thanks to the commendable graphic design and printing services staff - and it was a resounding, dazzling success. It turned heads all the way up the chain of command, and was received with delight by the users. I was enthusiastically told by an IS department leader that nothing of the kind had ever been seen before in any other rollout in IS, and it represented just the kind of thing that our department should be doing more of. I and my colleagues stood ready on rollout day for questions and problems, but heard only the faint hum of heightened productivity. While I fortunately didn't have to cope with the mechanics of the layout in Quark Express, I was also fortunate to be working with a designer with whom I could be specific and detailed in my vision of the final document, as I referred to my PD&I notes and materials. My users found it helpful that I prepared two PDF versions of the document for the eRoom document archive - one as the original two-page 11x17 format, and the other a four-page letter-size version to permit people without access to a large-format printer to produce a copy of the document, single- or double-sided. 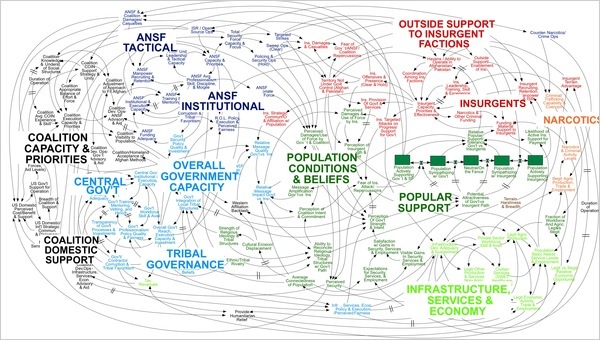 WASHINGTON -- Gen. Stanley A. McChrystal, the leader of American and NATO forces in Afghanistan, was shown a PowerPoint slide in Kabul last summer that was meant to portray the complexity of American military strategy, but looked more like a bowl of spaghetti. Commanders say that behind all the PowerPoint jokes are serious concerns that the program stifles discussion, critical thinking and thoughtful decision-making. Not least, it ties up junior officers -- referred to as PowerPoint Rangers -- in the daily preparation of slides, be it for a Joint Staff meeting in Washington or for a platoon leader's pre-mission combat briefing in a remote pocket of Afghanistan. "I have to make a storyboard complete with digital pictures, diagrams and text summaries on just about anything that happens," Lieutenant Nuxoll told the Web site. "Conduct a key leader engagement? Make a storyboard. Award a microgrant? Make a storyboard." Despite such tales, "death by PowerPoint," the phrase used to described the numbing sensation that accompanies a 30-slide briefing, seems here to stay. The program, which first went on sale in 1987 and was acquired by Microsoft soon afterward, is deeply embedded in a military culture that has come to rely on PowerPoint's hierarchical ordering of a confused world. "One of the first things [Steve] Jobs did during the product review process was ban PowerPoints. `I hate the way people use slide presentations instead of thinking,' Jobs later recalled. `People would confront a problem by creating a presentation. I wanted them to engage, to has things out at the table, rather than show a bunch of slides. 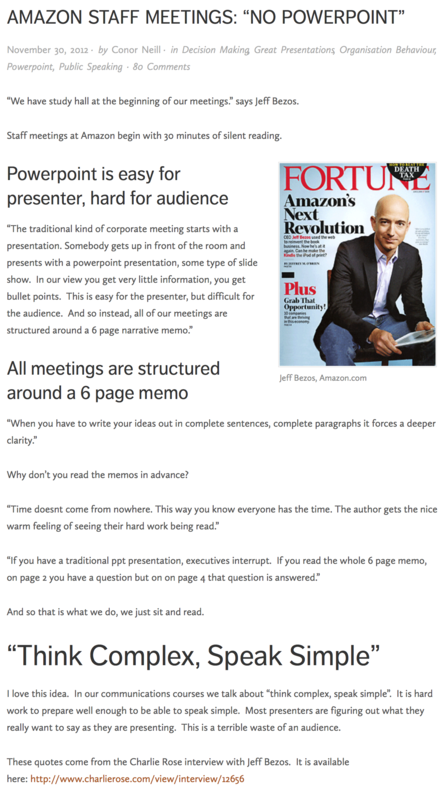 People who know what they're talking about don't need PowerPoint.'" -- Walter Isaacson, Steve Jobs (New York: Simon & Schuster, 2011), 337.